Countdown for Thanksgiving-Tips for Success! First things first, don’t go it alone. Ask for help and figure out who is bringing what. If you are cooking for a crowd, it’s helpful to start an email chain where people can commit to bringing items off a list such as appetizers, wine, desserts, or rolls. Don’t attempt to call everyone…it takes too much time. A great tool for managing this online is www.signupgenius.com. It’s free, (takes about 5 minutes to set up), and everyone can see what each person is bringing so there are no duplicates AND best of all, you don’t have to call each person on your list. Everyone appreciates being able to help in the easiest way possible and as the hostess, it saves you a TON of time! Another tip related to delegating: for a large gathering of any kind, I always ask people to bring the appetizers and desserts. I find it much easier and more efficient if the beginning and end of the meal is covered by others, leaving me to focus on the main meal only. This allows me to make sure the whole meal flows and the flavors of the various side dishes compliment each other. If guests bring side dishes, you run the risk of having three sides with duplicate flavors or sauces. Better for the host to control this very important part of the day and it’s much easier to plan for one part of the meal rather than get your head around all three elements (apps, main, desserts). Think through what jobs would be helpful to have people do during the day on Thursday. People generally will always ask “what can I do to help?” but if you do not have a specific task in mind, it’s often too easy to just say “I am all set” or “No thank you” when in reality you could use the help. Write out a list in advance of what quick and easy tasks would be helpful (light the candles, fill the water glasses, cork the wine, warm the rolls in the oven, etc) so when someone asks, you are ready to accept their offer …. no thinking required! Do things ahead of time- Make a list! This cannot be stressed enough as getting things done in advance goes such a long way in making things go smoothly. We all know this and hear it over and over, and it’s one of our top Thanksgiving tips, but it’s the execution that trips us up. Where to start? Easy: make a list and a timeline. Finish your shopping list & do your grocery shopping if you have not already. You really do not want to be in a grocery store on Wednesday if you can help it. Make sure you remember things like non-alcoholic drinks, paper goods, dinner rolls, ice and any staples (ie butter, spices, etc) you may need for your recipes. Doing the grocery store shuttle on Wednesday is not fun for anyone. Prep veggies. I always do butternut squash, mashed potatoes, green beans, and creamed onions for Thanksgiving. These are all easy to get prepped in advance. Then, on Thursday am the veggies are ready to be cooked with no peeling or prepping required and less mess to clean up. This may sound simple but it goes a huge way in saving time. Set your table! I love doing this a few days in advance. One, I find I enjoy it more when I am not in a final countdown of hours before guests arrive and I have time to adjust and tweak. Two, I find it makes the house feel more festive when the table is set a few days beforehand…it gives everything that “holiday” feeling and brings a sense of excitement to the house. Depending on the ages of your kids, you can enlist their help with folding napkins, placing the utensils on the table…whatever you think is appropriate. Get your serving dishes ready to go and determine if you need to borrow any items. I literally line up my serving dishes and serving utensils on my dining room table and drop a little piece of paper in each one saying what side dish goes with each dish. During the final prep of getting everything on the table on Thursday (let’s face it, this is the most hectic part of the whole day), people helping in the kitchen can just follow the notes. Might seem silly but the less thinking you have to do while you are getting the turkey out of the oven and doing all the last minute prep the better. You certainly do not want to be searching through your cabinets for a bowl large enough for the mashed potatoes 15 minutes before the feast! Finish desserts and pies, if you are preparing. Hopefully, as mentioned above, you have these covered by guests but if they have somehow fallen on your list, consider buying them instead. There are so many great places to buy fresh pies and desserts (your local farm stand is a great option) making desserts an easy way to save time and honestly, no one is going to care! Part of enjoying the day is realizing you do not and should not be doing it all. Move unnecessary counter top appliances such as toasters, blenders etc to other locations before the big day so you have plenty of room to work and organize. Thanksgiving is about being thankful after all. It’s meant to be about sharing time with family and friends and being thankful for our blessings. It’s easy to forget that in all the shopping and chopping, Thanksgiving is a holiday that’s meant to be enjoyed, and that’s my favorite Thanksgiving tip! Here’s a sentimental touch that is easy enough to bring the meaning into your holiday: ask your kids (and adults too) what they are most thankful for and have each person write it on the same piece of paper. Pop it into a frame and display it on your table or in a prominent spot in your kitchen for your guests to enjoy. It then becomes a wonderful keepsake to save and take out each year. You could also buy a special family journal and have family members write in it each year and the younger kids could draw pictures. It’s such an easy way to create wonderful family memories and does not require much effort at all. YOU will be thankful for it in years to come! When my son was four, he wrote down “apples, the earth, and his brother”, drew cute little pictures and I ended up getting it laminated. I take it out every year on Thanksgiving and it is one of my favorite Thanksgiving keepsakes. 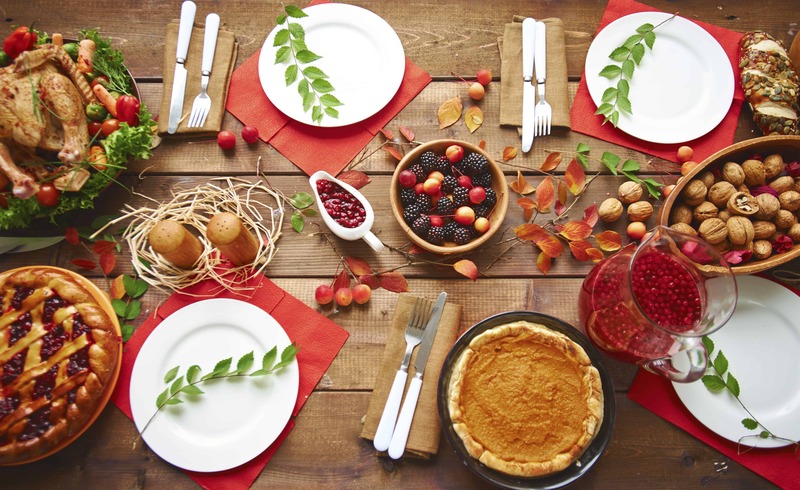 While most of these Thanksgiving tips are meal-focused, it’s not all about the meal ( although we admit this is very easy to forget – not everything has to be perfect!) I have to remind myself of this every year..it’s not easy but I find the more I host the more I realize it. Buy yourself some flowers as a reminder (what better excuse could there be? ), consider preparing the fireplace for a nice fire after dinner, or get your holiday pj’s out and ready to put on after all the guests have gone. You will have time to then reflect on the day and all that you are thankful for!!! WISHING YOU ALL A HAPPY AND STRESS FREE THANKSGIVING!